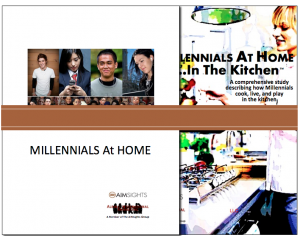 MILLENNIALS At HOME is the groundbreaking industry report published by The AIMsights Group in 2010 that examines how the next generation of homeowners and renters live within their spaces. This in-depth study reveals the unique characteristics that make up this generation and provides a thorough understanding of how these traits affect their purchasing behavior and preferences. 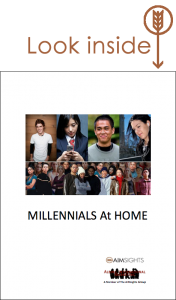 It shares pictures of what Millennials look for in their homes today, as well as what they envision in their future homes 5-10 years from now. The Millennial generation is 80 million strong and represents $350 million in spending power and $1 trillion in spending influence. They are between the ages of 18 – 34 years old and are changing the face and identity of the home forever. It’s imperative that you get to know them, and get to know them well. Please read the following before completing your download. 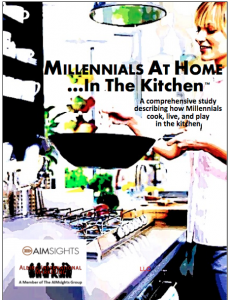 AIMsights reports, including MILLENNIALS At HOME and MILLENNIALS At HOME…In the Kitchen (“The Reports”) are for internal use only, i.e. for you and your direct colleagues, who work together on a regular basis and are located in the same office. If you would like to share a full report with more than 10 direct team members or colleagues, we ask you to consider purchasing an additional copy. You are welcome to present the content internally or to share excerpts of The Reports in internal communications. (In fact, we welcome it!) We also encourage you to present parts of the reports to your clients or customers, helping them reinvent their businesses, but only if you always state the source (The AIMsights Group) both verbally and on any written materials. The contents in part or in whole should not be used and presented to external paying audiences (e.g. industry conferences, paid workshops). That’s our job! Of course, you cannot create derivative works based on The Reports or repackage/resell them without our permission. We ask you to respect this ‘honor’ system. It allows us to continue our innovative research and offer our findings and insights to you. If you have any questions about how The Report can be used or to purchase additional copies, please contact Whitney Ryan at whitney@aimsights.com.